Here at Safe Bathing Canada, we aim to revolutionize the way that people think about enjoying long, luxurious soaks in their tubs. Most importantly, we want to create new possibilities to people who are unable to enjoy baths due to limited mobility. We want to create bathrooms that are therapeutic havens without the typical hazards that come with traditional bathtubs. Walk in tubs are unlike a standard bathtub in that it has an easy access airtight and watertight door on the side. That means that you can simply walk into the tub, rather than having to climb over the side and into a slippery bath. Additionally, it has built-in floor traction to prevent slips. The strong, durable grab handles provide further peace of mind and the ability to easily move around without falling. People with chronic pain and arthritis could often benefit greatly from a relaxing soak. Whether they have an existing tub or only a single shower stall, Safe Bathing Canada can help them transform their bathrooms from dangerous to spa luxurious. 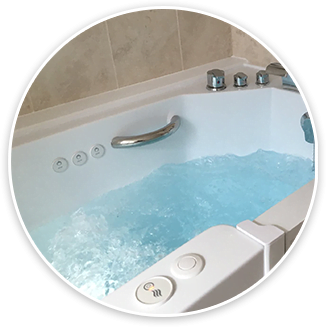 We also have wheelchair friendly and bariatric models, as well as tall designs for clients with long legs who would like to enjoy a deep, indulgent soak. 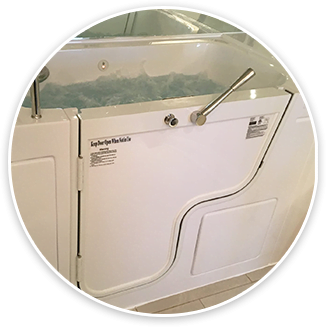 Safety tubs extend the amount of time elderly people are able to live comfortably and independently in their own homes. It enables them to enjoy luxurious baths unaided, which in turn provides many health benefits that keep them healthier and happier for longer. Heated seats - A simple touch of a button will provide you with gentle, therapeutic warmth for as long as you need, which will soothe your aching muscles. Warm air massage jets - Variable power settings provide an invigorating massage, a smooth tension releasing massage or a soft, relaxing massage, depending on your mood. Enjoy a chromatherapy or aromatherapy soak with one of our luxurious safety tubs. Now you don't have to live in fear of bathroom safety hazards. Let a friendly, helpful Safe Bathing Canada consultant show you how you can own a safety tub for as little as $5 a day.